Happy Memorial Day. I have a old completely non related post for today but have had these pictures for almost a year and wanted to share them. Me and the family are out having a BBQ and taking the day off enjoy. These are pictures we took of a bee swarm in our yard from May 2015. We never got around to blogging about them. My son when playing out in the yard told us there were a lot of bee's in the back yard. Mom did not believe him. When I got home from work I went to check it out and too my surprise there were thousands. This is what happens when a hive splits and they swarm away. Any way a friend of ours has bee's and was willing to help re-locate them for us. The bees have been relocated a few houses down. There were enough to start a small bee hive. It is rare but there are times that Tanya makes pieced quilts. A lady at church (well I still consider her a young girl at church) she has grown up and got married and moved in next to her parents is having her first baby. Tanya is her visiting teacher and decided to make a quilt to take to her. This girl use to Read with Rebecca when she was younger and could not read well so she is special to our family. You can tell when Tanya sews. She pins every thing me I just sew it too gather it takes too long to pull out those silly pins. Any way the top looks cute and it now needs to be basted and quilted. Its funny yesterday I posted about quilting this and now I will post pictures of it being made. This is just a simple and cute quilt using our HST pattern that we sell on Craftsy. Tanya and I have a system. I cut and sew the tops. She bastes and makes the bindings. I quilt and bind. But Today Julia had to get into the action. She is now 4 and just growing up. She just finished her first year of school well if you call parent/tot pre-k school. Next year she is in pre-school by her self. As you can see from photo's she loves her picture taken. Last week I quilted this custom HST quilt it is for a custom order. I Echo quilted all the sewn lines in the quilt nothing fancy. The material is from the client we did just the sewing and batting. Only issues I see in quilt is that we had few materials so there is lots of repeats and like fabrics next to each other but it turned out cute its in wash now. Oh and Today is Tanya's B-Day so happy B-Day my wonderful wife! I can not figure out what my deal is lately. I keep making quilts and then staining them. Today I am doing a partial show of a quilt I made for a family that lives a couple blocks from me that just had their 4th daughter. I will show off the full quilt later but here is a teaser from my Binding. The picture above was taken just after I finished the binding. I think it looks pretty neat just laying there on the table but that is not really what this post is about. I did some free motion quilting on this quilt and its not something I am good at. This quilt screamed for something other then my normal strait line quilting. My wife tells me I did it more dense then she would have liked, but I think it turned out pretty fantastic. Though what I want to share is my bad luck in the washing machine. My kids it seems washed a pen recently. Well Pens and a new quilt do not mix well. You cant hardly see it, but in the picture below there is a long black streak on the quilt that is ink. My wife washed it a second time and yep got the ink out on the back and got new ink on the front. It took 2 more washes to get all the ink out. Will give more pictures later of the finished quilt. One of the things that happen often in our house is that we get distracted and go from one project to another. Today's post is a quote from the Movie Up ... Squirrel! My pictures today is from 3 recent projects I have been working on. none of which is done as of today's date though some are close. The first 2 are from old projects that have been sat aside and just now dragging them back out. Then what fun would it be to finish a quilt so here I am starting a diagonal quilt. Yes just chasing Squirrels today. This quilt was finished the middle of last year and this blog post created but never posted. Here is another fun rag quilt that we have done. Last night, I finished up sewing my two Diagonal Quilt tops. Both of these quilts when finished will be put up for sell on my Etsy Store. I currently have 2 diagonal items on my Etsy Store. The first is a Aqua, Gray, Yellow, and Turquoise lap quilt. The other is a 24 inch table topper. Today's post is kind of lame. I am cutting up my batik bundle and making 2 diagonal quilts. I should have the top finished on one of them tonight. Maybe both. I enjoy making these quilts as its like a puzzle you cut things up and then piece them back together slowly tell you have a complete picture. The batiks I have are fantastic for their rich color I cant wait to see what a completed top will turn out like. I am taking a business class through my church. I need help asking about customers needs and why people buy certain products. It is difficult to do since the majority of our business is online with an occasional craft fair setting. I also have a set of questions for other small business owners. I could really use some help answering questions if you have time. Feel free to email me at thealey101 @gmail.com to answer questions, if you don't want to comment on blog. Either would be really appreciated. 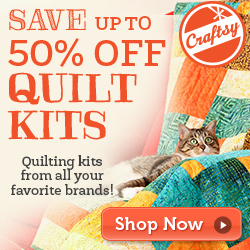 Why do you buy patterns or quilts from a certain business? What would change about a product? What would make you want to buy more? Is a price right? Would you buy more at a lower price? Would you still buy more if they raised the price? What do your customers buy most? Why do you think people buy what you sell? Who are your competitors? What is unique about your business? Where do you get your product? Are there other suppliers? Do you think you could get a lower cost if you buy more at a time? How did you decide on a price? Are you profitable? What have been some of your keys to success? Biggest headache? Last year some time my wife bought me this huge stack of Batik's and as my wife said I did not seem excited or care. I dont know how I went almost a year with out being excited about these but for my Birthday I decided to treat my self and cut into this stack. I started last night (My B-Day Eve) and I finished this morning. And will share in Pictures. I really enjoyed visually how this stack was put together it had the lighter on one side and the darker on the other side. So I had to get a picture of both sides of this bundle to show it all off. The way my wife cuts material is so much different then my style of cutting. Many or most I would assume cuts 1-2 layers of material at a time. For me that is way too slow and not as efficient. It might be hard to tell but the stacks that I am cutting are about 12-15 layers thick. The cutting blade I use is the larger of the 2 standard size blades and I always make sure my blades are sharp as I like to cut thick stacks. Here is more of a close up. Please note these are 2 stacks thick each but gives you an idea of how many layers are in the stacks. So you may ask what in the world am I doing with all of these. My plans are too make 3 quilts (yes I cant ever seem to make a single quilt at a time, though Tanya is trying to convince me to make 4 rather then 3 quilts go figure) To explain the material at the top of the above picture is what is left of my Fat Quarter Bundle which is about 1/3 of the fabric left. The long strips will be a diagonal lap quilt and maybe a 2nd baby quilt if Tanya gets her way. The 2 1/2 inch squares in the 3 bags will make 2 different quilts one will be one of my 25 squared patterns and the other will be a granny square quilt which I have made many times but never made a pattern for but will make a pattern this time while making it. Well I still had a little time before having to leave for work so I started to sew my strips together. At the point I took this picture the strips each had about 6 strips sewed together so the weight of it was dragging them off the side of the table. The funny thing about Batik's are that my wife hates them and complains and the longer I play with them and sew them together the more she starts telling me how much she likes them and wants me to make more and more. She just cant make up her mind. What I love most is the contrast in the colors. Any way this is the pile that I had when all the strips were sewed and there is only 5 long strips left. 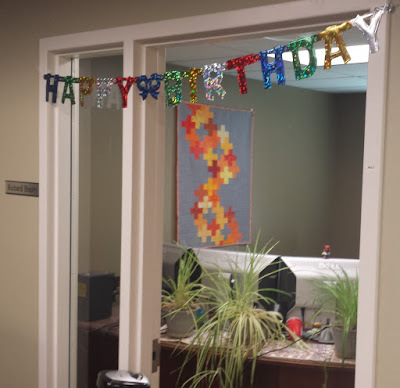 While I am finally at work and they thought to celebrate and since it also shows off the quilt on the wall in my office I took a picture sorry for the poor quality and poor editing I was at work after all but Happy B-Day to me. And for those that are curious I turn 47 today. I was born in the summer of 1969. Last and not least Google had to get in on the B-Day Action and I seem to be getting a B-Day google celebration page. If you click it it goes to my profile so good job Google and thanks.